Shop Smart: We act as a Shop Smart "Apply Here" point in Church Walk , so drop in to get your card, or to hand in the new passport cards. 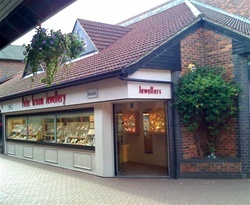 Peter Groom Jewellery has built an enviable reputation for giving customers the highest standards in quality and service. We specialise in contemporary and classic jewellery made from platinum, gold and silver. Because of our cost effective location in Caterham we are able to offer superb value for money. This is helped by our in house skills and experience gained over the past 30 years. We have a qualified gemmologist and diamond grader.